The Aztec Empire was established after subjugating the neighbouring city-states who paid regular tribute to the empire. The economy of the Aztec Empire itself was sustained by three things. This included the tribute from the subjugated city-states, agriculture and farming, and trade. All three were vital to the empire but perhaps the most important pillar of the Aztec economy was its trade. This was because a lot of goods used by the Aztecs were not locally produced and thus they needed to trade with others to acquire those goods. In the initial stages of the Aztec capital, Tenochtitlan, farming was the main source of Aztec economy and the city could support itself. Farming was done using the method of chinampa which was also used among the previous Mesoamerican cultures. With the growth of the population, the ambitions of the ruling class also grew and this brought them into confrontations with neighbouring tribes and city-states. Through various wars a steady stream of tribute was ensured and trade between different city-states also flourished. The inhabitants of the city of Tenochtitlan indulged in a variety of professions to contribute toward the Aztec economy. Members of the lower Aztec classes mainly indulged in farming. 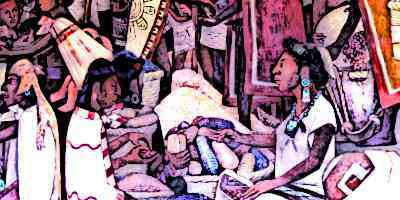 Trading was a very important element of the Aztec economy in the capital city of Tenochtitlan. According to the Spanish conquistador, Hernan Cortes, the sister city of Tenochtitlan, Tlatelolco, had a central marketplace where over 60,000 people gathered daily for trade. Finally, the tribute from the subjugated city-states also contributed toward the Aztec economy. Extensive trading took place between different parts of the Aztec Empire and a variety of goods were transported from one city-state to another. The travelling merchants used canoes to transport their goods along streams and rivers. Important goods that were traded at the marketplace included cloth, garden produce, knives and tools, leather and furs, animal skins, precious metals, pottery, and others. Some traders traded exclusively for the nobility and procured precious metals and other goods for them. Other than these central marketplaces, there were also smaller markets which specialised in various kinds of goods. For instance, one small marketplace could sell slaves, another one would sell only precious metals, and so on. Craftsmen contributed toward Aztec economy since the Aztec culture highly valued crafts and arts. While the nobility, as would be expected, collected works of art and crafts, even the common people did the same. Thus Aztec craftspeople and their works were in high demand in Aztec economy. There were specific art schools in Aztec Empire where children who showed talent for arts and crafts were educated. They were taught the use of precious metals for jewelry making in addition to other crafts. The responsibility for collecting taxes from the local population was delegated to various clans known as Capulli. These were collection of interrelated families who managed a certain area and looked after the people. 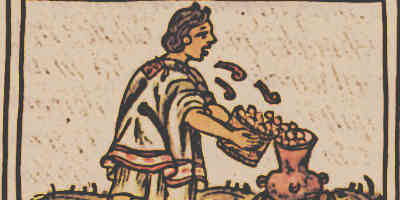 Agriculture was one of the most important sources of sustenance for the Aztec economy. Since the capital city was founded on a swampy ground, Aztecs used a special method of farming called “chinampa”. In this method, small rectangular areas of land were used to grow crops on the shallow lake beds of the Mexican Valley. Aztecs grew a variety of corps, most important of which was maize, squash, and beans. These three crops were known as the “three sisters” and planted together since they kept the nutrients in the soil. Since agriculture was crucial to Aztec economy, a lot of young people adopted agriculture as a profession. Crops were also used to trade for other products such as animal skins or woodwork. There were central regional markets in every city-state of Aztec Empire. The city of Tlatelolco, for instance, had a central marketplace where over 60,000 people traded on daily basis. These marketplaces were not only a source of trade between different places but also served the purpose of dissemination of news. Smaller, local Aztec markets dealt in specialised goods. For instance, there were local markets that only dealt with the sale and purchase of precious metals. While the larger markets remained open throughout the week, smaller ones mostly remained open only five days a week. Since trading was one of the most important components of the Aztec economy, travelling merchants enjoyed a higher status than the ordinary people. These professional, long-distance travelling merchants were known as “pochteca” and, other than trade, were also a source of communication between different parts of the empire. These Aztec merchants traded in all sorts of goods including food, garments of various kinds, feathers, slaves, and precious metals etc. Some pochteca also traded exclusively for the nobility and sold their surplus tribute in the marketplace. Due to extensive travelling, these traders were also employed as spies by the empire. The wealth of Aztec Empire was sustained through tribute and trade, other than its agriculture. Tribute was very important for Aztec economy and thus the empire constantly waged battles against the neighbouring city-states in order to ensure a steady supply of tribute and war captives. Trade between different parts of the empire was also central for the wealth of Aztec Empire. 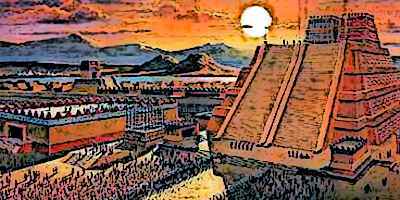 The capital city of Tenochtitlan was considerably wealthier than the other city-states since it not only indulged in extensive trading but also collected tribute from all the subjugated city-states. The Aztec economy was sustained through three main pillars of agriculture, trade, and tribute. Agriculture was needed to fulfil the food needs of the population while surplus produce could be used to trade for other goods. 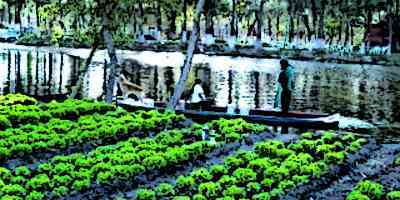 Given the swampy ground of the Aztec capital, special farming method called “chinampa” was used to farm the lake bed. Tribute contributed considerably to the wealth of Aztec capital and constant wars were fought to ensure its steady supply. Finally, travelling merchants traded between different parts of the empire and sold the surplus goods of one place to the other. These travelling merchants also served as a source of communication between different regions of the Aztec empire.